For the past couple of days we talked about the yen, comdolls, and the Greenback. In today’s edition of Piponomics, we’re turning our spotlight onto the British pound. Here are three possible reasons why the pound bulls are still hanging around. It’s hard not to support the pound when the U.K.’s economic data hints that the economy is on the fast track to recovery. The manufacturing, construction, and services PMIs continue to surprise to the upside and lending and housing numbers up. And don’t even get me started on the labor market! A few hours ago we saw the U.K. unemployment rate drop from 7.6% to 7.4% in October, its lowest level since April 2009. If that’s not good news enough for you, then you should know that claimant counts also fell by 36,700, a step up from the expected 35,200 decrease. For forex newbies out there, you should know that high employment numbers usually lead to more consumer spending and other economic activities. Despite several attempts by BOE officials to talk down the pound, many market players still believe that the recent improvements in the economy would compel the BOE to raise its interest rates sooner rather than later in 2016. The central bankers are certainly no strangers to adjusting their forward guidance. Just a few weeks ago Carney admitted that the BOE’s 7% unemployment rate target is a threshold and not a trigger for reducing its stimulus. With flexibility like that, it’s no wonder the pound bulls react so strongly to positive reports from the U.K.! If you’re like Pipcrawler and Huck, both of whom tend to watch the major currency pairs, then you couldn’t have missed GBP/USD’s retest of the 1.6250 support area. Not only is the handle a Fib retracement level, but it has also held as resistance in the recent past. 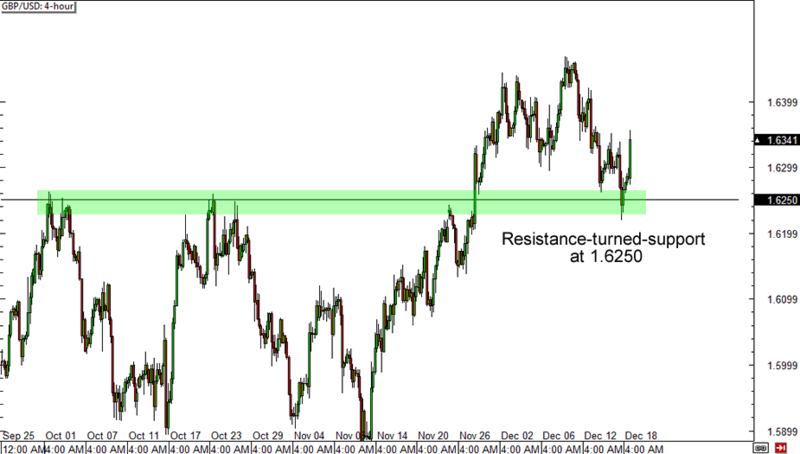 Now here’s a question for technical traders: Does the bounce mean that GBP/USD is headed for new highs?